First in a series of six snaps found by investigators of the Office of Chief of Counsel for War Crimes in their search for material for use in the trial against officials of the Farben combine is this foursome, enjoying either a speech or bit of entertainment during a banquet in Peterberg 23 June 1937. Left to right are Prof Dr. Carl Bosch, famous for his work in the Fritz Haber-Bosch nitrate process. He was winner of the Nobel Prize in Chemistry in 1931, having gone over to Farben 2 December 1925. Bosch later became chairman of the Supervisory Board of Directors of Farben on 27 April 1935. 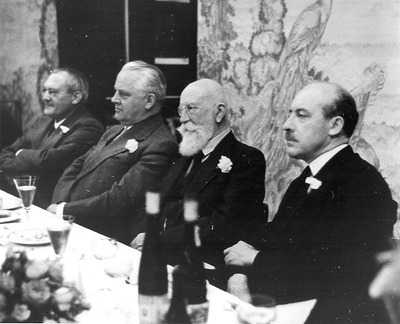 Hermann Schmitz is seated with his hands folded next to Adolf Haeuser, Hon Dr. University of Munich and of Marburg who became a member of the Supervisory Board in 1926. At extreme right is George von Schnitzler.